I needed to repair the slot on my crosscut sled (actually three of them) after aligning my table saw. The blade widened the slot enough that the zero-clearance feature of them was gone. I decided to give The Wood Whisperer's epoxy fix a try. After doing the first sled, a small parts one I wouldn’t mind re-making if this screwed up, I found that the bottom of the slot was perfect because the tape held the epoxy perfectly level, while the cleanup on the top surface (where the boards you’re cutting rest) was more difficult. I did get in there before the epoxy fully cured with my chisel plane and cleaned it up pretty well, but there was still some sanding to do and I was concerned about damaging the surface and making the sled less accurate. 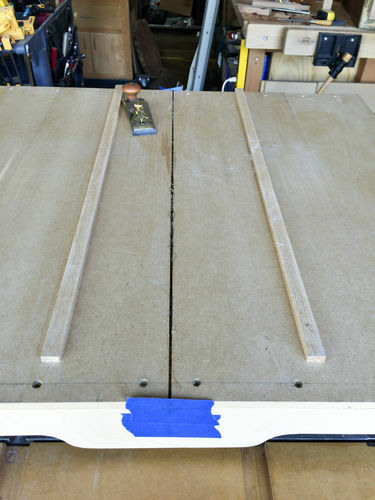 For my large sled I use for up to 28” crosscuts, I decided to reverse the method and put the tape on the top surface of the sled and pour the epoxy from the bottom. The result was outstanding. The surface of the epoxy was perfectly flush with the top of the sled and as an added bonus, gravity allowed me to tape off the front and back fences and get them filled with epoxy (photos below), something I had to do in multiple pours going from the top surface. One more thing to keep in mind is that doing it this way means you really don’t have to completely fill the slots, since the top surface will have a perfectly flat epoxy fill due to gravity, and that will return the zero clearance aspect of the sled. Because the bottom doesn’t have to be flush, it’s easy to clean up any overfill/drips with acetone. Doing so pretty much removes any need for cutting and scraping after the epoxy starts to cure. 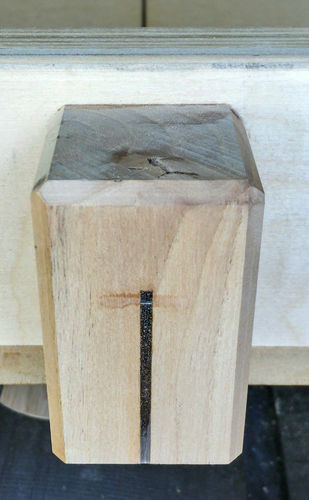 (I discovered this trick doing my corner miter spline slot cutting jig, after doing my large crosscut sled shown in the photos). Note that my sled is an old school design. Something like that shown in The Wood Whisperer’s video would require removing the t-track from the fence at a minimum, and might not be feasible at all. It’s hard to tell for sure just looking at the video. The bottom line is, either way you do it Marc’s epoxy repair is an excellent solution. Thanks Marc. It’s hard to actually see the epoxy. Suffice it to say that you’re not seeing it smeared over the surface of the sled. Thanks for sharing your experience. That’s original thinking. 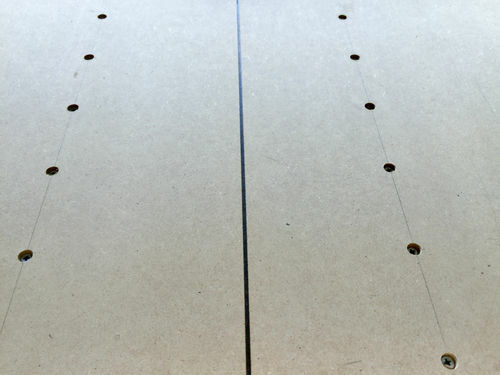 I agree, while you wouldn’t want the epoxy fill to be too shallow, there is no reason to fill the kerf completely. Thanks for sharing this simple but effective adaptation.